Lucknow University invites applications for admission to 5 Year MBA through LUGMAT 2016. If you want to join 5 Year Integrated MBA in Lucknow University then you must need to pass the entrance exam i.e. 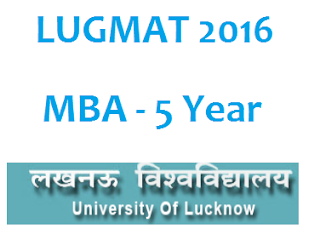 LUGMAT 2016 which will conduct by Lucknow University. Last Date for submission of Online Application form for LUGMAT-2016 is 31st March 2016.